Normally I am suspicious of establishments that attract visitors with red lights. Casinos and houses of ill-repute come to mind. 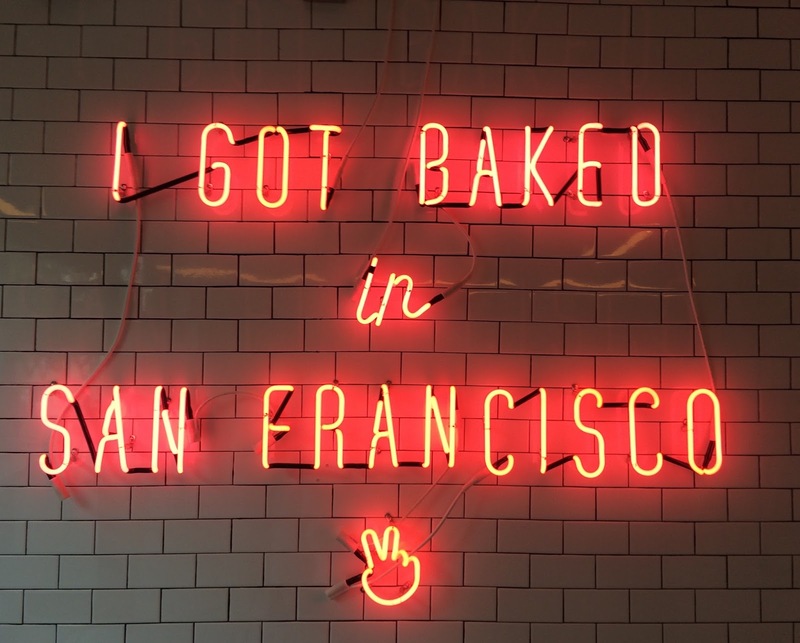 However I forgive Mr. Holmes Bakehouse for this offense because they make incredibly delicious French pâtisserie (including some innovative modern twists). The pastry chefs obviously had French training, and the pastries are as good as those you'd find in France. Delightfully fresh and made with the finest ingredients including plenty of butter, Mr. Holmes pastries are truly irresistible. Despite its repertoire of traditional pâtisserie, Mr. Holmes Bakehouse has imagined itself as more than just a classic French bakery. It's an all-American phenomenon, a cult of personality complete with kitschy marketing slogans. I arrive at 8:15am in the morning to find a bright-pink sign explaining where to wait for freshly baked pastries. A two-block-long queue of people has already arrived. With so many giddy tourists and a few locals chatting excitedly, I half expect the pastry chef to pop out with the paparazzi trailing him. 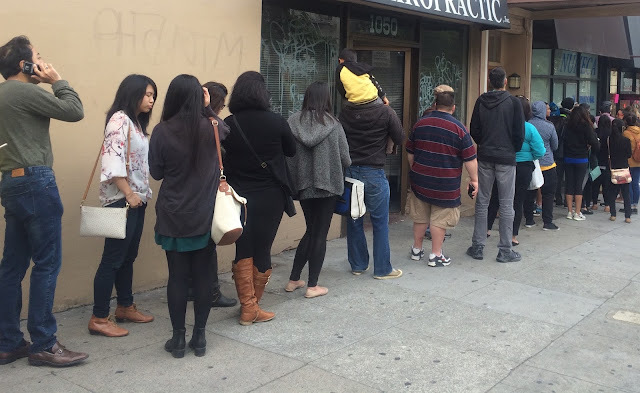 The scene looks more like a line for tickets to a rock concert or to get into a nightclub. 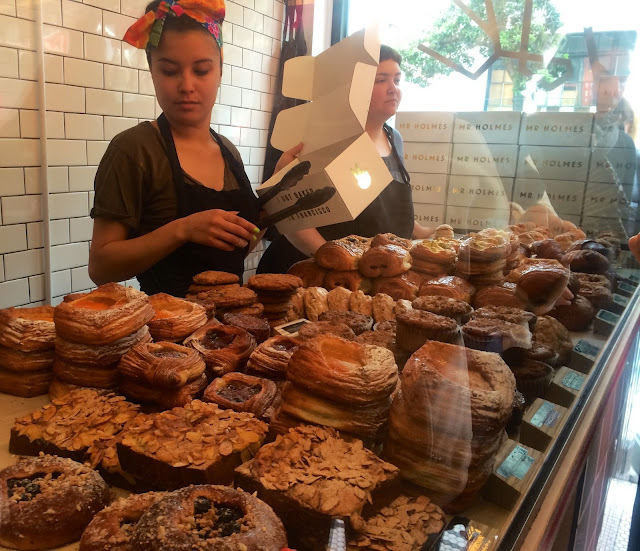 Mr. Holmes Bakehouse offers typical French pastries like croissants, danishes, Paris Brest (filled with praline cream) kouign amann (croissant pastry with a caramelized crust) and fruit tarts as well as more creative options. Their most hyped offering (that inspires customers to stand out in the cold for an hour) is the "Cruffin" (a hybrid between a croissant and a muffin), but I found it highly disappointing (maybe my expectations were set too high). The Cruffin has a bombastic style that is in your face (literally) but lacking elegance. Out of the selection that I sampled, my favorites were the donuts, they're incredibly fresh and have delicious fillings like chocolate caramel and fresh strawberry-banana. The most unique pastry is the California Croissant stuffed with salmon, ginger and wasabi that resembles the flavors of California Roll sushi). Marketing gimmicks aside, Mr. Holmes Bakehouse is a top-notch bakery. The croissant are excellent and the donuts are out of this world! Everything at Mr. Holmes Bakehouse is sensational, except for (surprisingly) the Cruffins, which are the only thing that is not worth waiting in line. So my advice skip the hour-long line. Instead spend that time at the gym so that you can afford to sample more than one of the pastries at Mr. Holmes Bakehouse. The shop is open until 2:30pm daily and until 3:30pm on weekends or until they sell out. The humble croissant is one of the best pastries at Mr. Holmes Bakehouse. "Ceci n'est pas une Cruffin." This is not a Cruffin. This is better than a Cruffin. It's a kouign-amann. Copyright © 2017, Lisa Alexander. All rights reserved. How was the California crossaint? I am not sure about ginger and pastries. Thanks for your comments. I'm glad that you enjoyed the post. Hope that you have a chance to sample Mr. Holmes Bakehouse pastries sometime soon. The California Croissant flavor combination may sound unusual, but it all takes very good together!